Home / Low Voltage (12V) Landscape Lighting / Landscape Lighting Accessories / Landscape Lighting Tools / VOLT® Flexible Auger Drill Bit 54"
VOLT® Flexible Auger Drill Bit 54"
Ever have trouble getting lead wire under a sidewalk? 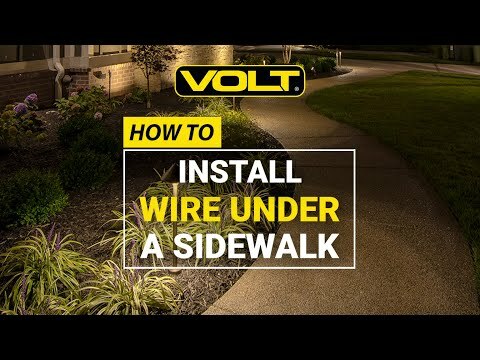 Introducing VOLT®'s Flexible auger drill bit which features a hole for guiding cable back through and getting those wires under your sidewalk the easiest way possible without damaging the concrete. Start by digging out the grass on the sides on the slab you need to get under and drill the auger bit right under the concrete to the other side, from there you can slip the lead wire through the hole and pull the bit back through which in turn will also pull your lead wire with it. The auger drill bit fits most standard size power drills and with the flexibility makes this the only solution for keep wires out of sight.